Call for your free quote and catalog today. Welcome to Rettey. Manufacturer of Rettey Pontoon Boats and Floating Docks in Kits or Fully Assembled. 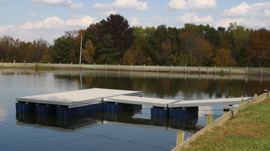 Rettey Pontoon Boats, Floating Docks, and Platform designs are based on unique plastic pontoons in 4-foot sections. The versatility of our component-part design makes it possible for our boats to be purchased as a build-it-yourself kit that can be shipped to you by UPS or truck. Completely assembled Pontoon Boats and Floating Docks are delivered from the factory to your door or can be picked up at the factory. Rettey Pontoon Boats and Floating Docks are designed to be affordable for all families. Rettey Introduces the Sport Cruiser. Rettey Pontoon Boats Kits Available! Every Rettey model and size is available in kit form. Increase your savings and privde of ownership by building your own boat. All materials, prices and specifications are subject to change without notice.